BRIEF: To replace a static old website with one that could be administered without requiring external support, would display beautifully on tablets and smartphones, would integrate with the Stonefields newsletters, and would provide various areas of functionality typically available from good content management systems. SOLUTION: We developed a WordPress content management system and set it up with all the functionality that was required, then uploaded all the content from the old website plus additional new content. We kept the cost right down by adopting one of the latest available responsive WordPress themes, using existing logos and images, and setting up a “free for life” MailChimp eNews account with a template to match the website. 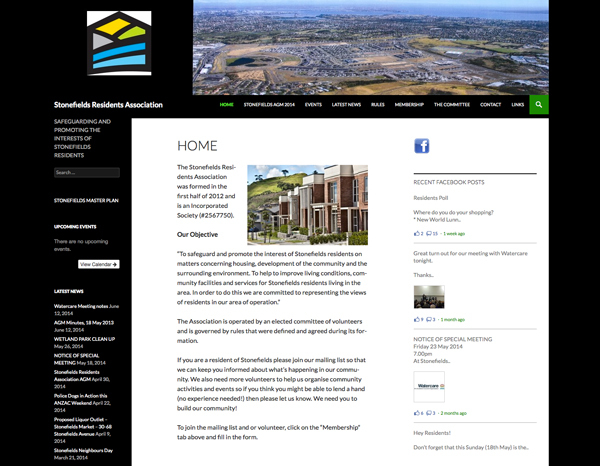 OUTCOME: An attractive website that should serve the residents of the Stonefields sub-division very well for the foreseeable future.